[Chuck] sent me this How-To on building your own custom Guitar Hero controller. I love the idea – the stock controller is a bit small for me. This one was built for a Child’s Play fund-raiser, so maybe you can score it and help get some games to some kids in need. Remember, there are just 20 more days to get your entry in for the Design Challenge! I would’ve wanted that guitar. What a waste. 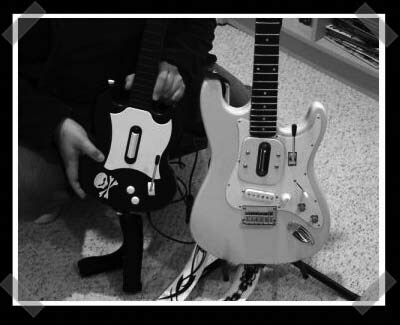 i remember a guy coming into the irc channel talking about modding an actual guitar into a guitar hero controller. either he succeeded or his idea was completed by another. nonetheless, great idea and a great hack! #2 – that’s probably the best possible use for a pos squire bullet (other than stunt-axe for jimi hendrix stage antics). your $99 will go further on a better quality used axe. that’s a really great hack, in the true spirit of hacking. Does the guitar still work? That’s lookin like a Fender (or a Fender knockoff), and it’d be a shame to ruin one of them. #5 – i hate acting like a thread nazi, but it’d be nice if you clicked the link and at least skimmed over the 1st page… you’d answer your own questions and perhaps even be able to post something relevant. I think it would be cooler if you had a circuit that could tell which notes you played and closed the fret switches accordingly. And any sound received wiggles the string thing. Please do something, i would really like to make myself one of this!!! Yeah you’re probably right. I am looking for more insight on good guitars for christmas. They could have saved some work by using a hollowbody guitar, more room for batteries, electronics, etc. But everybody wants a strat, right? Personally, what a waste of a good guitar. I prefer to stick with the stock controller and I don’t want to destroy my real axe because I’m considering learning how to play it in the future. Looking for some one who can provide some help with the dos and don’ts of hacking guitar guitar hero. Need someone to help me out with the dos and dont’s of hacking guitar hero.. Will compensate for time. That mod is kinda lame. Just a transplant of parts into a real guitar. Nothing special. If you want to see a real mod, click my site link. That is the most retarded thing I have ever seen. GH blows, and this is even worse. Why would you waste a perfectly good Strat? I say, whoever did this is a loser, never learned how to play the Real Guitar so decided to make it a GH guitar. Thumbs down to you!!! Тех кто не был в Чехии, но кому приходится по душе средневековая эпоха, мы приглашаем посетить удивительное место – ресторан Прага. Здесь вас ждут роскошные блюда, как современные, так и средневековые явства. Приходите – не пожалеете! Мы ждём Вас на нашем сайте – Заходите!